It's a great album and it's good to see it getting a wider release while we wait for the second album. 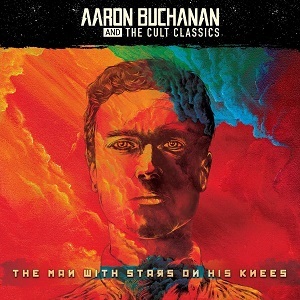 In 2017 Aaron Buchanan and the cult classics released their debut album, “The man with stars on his knees”. Now, newly signed to Listenable records it’s being re-released, this time as a special edition with bonus tracks. Normally I’m not a fan of bands doing special editions of their albums a year or two after release since it penalises people who bought the original version and now need to buy it a second time to get the extra tracks, but when the original album was released independently and the special edition gets the sort of distribution that comes with having a record label then that’s understandable. The special edition apparently comes with “two brand new stduio tracks” and three live tracks. The first of the “new” studio tracks is “Fire in the field”, and isn’t actually a new track – in fact it was on the original CD release. The other track is a new one – “Undertow”, and it’s a great song that fits in well with the rest of the album. If you don’t have the original album then I’d definitely recommend this album. If however you do have the original version then the case for buying the special edition is a lot weaker – you’re paying full album price for one or two new tracks plus three live tracks and whether that’s worth it will depend how big a fan you are. It’s a great album and it’s good to see it getting a wider release while we wait for the second album.